These stunning laser cut acrylic promotional window badges are perfect for those looking for a modern high quality alternative to plastic or metal. They are UK manufactured and reverse screen printed to leave a clear gloss finish. 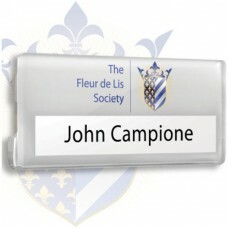 The top and side edges of the badges can be laser cut to your unique shape at no extra costs. and they are supplied with plain card inserts as perforated A4 sheets for you to personalise. There are 3 standard badge sizes with different window depths and are supplied as standard with bar pin or dual pin & clip fitting. Magnetic fittings are also available at an additional cost. Prices are based on a 1 colour print to 1 position. The colours shown are only for guidance and cannot be taken as a true representation. Minimum order is 25 off.